A high school friend of mine, Ashley, wrote a really interesting post about trying to figure out her employment situation after her three children were all in full-time school, and she referenced this book. Well, I cannot read about a book on this topic without immediately requesting it from the library. And, of course, I cannot read a book like Homeward Bound without forcing everyone I come in contact with to listen to me ramble on at length about it. My poor friend, Celeste, who foolishly offered to carpool with me to a church event and had to listen to me talk about it for twenty minutes there and then another twenty minutes home. She will likely not make that mistake again. 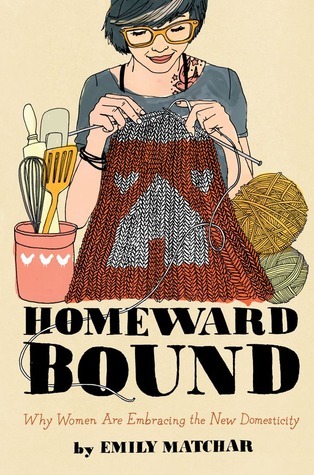 Five paragraphs later. . . .
Homeward Bound explores the movement of people (mainly women) back to more labor-centric hobbies and lifestyles, whether that means cooking everything from scratch, starting an Etsy business, homeschooling, gardening on a serious level, or living off the grid. Matchar discusses what kinds of things push people toward this – a poor economy, unfulfilling jobs, distrust of government systems, bored women staying at home with small children, the general trendiness of all things domestic – and shares tons of anecdotes about people on the whole spectrum, whether they are completely self-sufficient or whether they periodically can some tomatoes they bought at the farmer’s market. What’s the cost to society as a whole if you opt-out of the system (for instance, homeschooling your children, which deprives the local school of your influence and involvement, or opting out of a career as a woman, which can make it more difficult for other women to advance in professional fields, or refusing vaccinations for your own children because of the risk, depending on everyone ELSE’s vaccinated children to keep your child from dying of whooping cough)? Bart and I talked about this at length – it’s such a fascinating and relevant dilemma. It’s interesting to see how extremes on both sides of the spectrum start looking very similar in many ways. Both groups might be growing all their own food, opting out of the “system” in various ways, and rejecting traditional paths, but doing it for completely opposite reasons. (I tried to explain this to Bart and I did a horrible job, so. . .read the book and see what I’m talking about because I’ve probably completely botched it here too). There is a huge difference between growing a huge garden, sewing all your own clothing, and making soap when you GET to choose that and doing it because you have no other options. Etsy is making a boat load of money on people selling things through their platform. Many corporate careers today are just not very flexible or fulfilling, so the appeal of a slower, more engaging way of making a living is understandable. I do think it’s much easier to be a stay-at-home mom when you have a social outlet that keeps you from feeling so isolated (but then, I’m comparing it to nothing because I’ve NEVER been a stay-at-home mom without a blog and a Twitter account). Fine. I want chickens in my backyard too, someday (but I’ll make Ella deal with them because she loves animals and birds of any sort freak me right out). I’d definitely put this book more into the “thought-provoking and discussion-worthy” category, rather than the “best-book-I-ever-read” category. I found the chapters to kind of blend together. I’d read one and then two chapters later think, “Wait, how is this different from the chapter I read yesterday?” It kind of all muddles together and there is a lot of overlap and repetition. I definitely think it could have been edited down quite a bit. I felt like there were many MANY generalizations (yes, I recognize you can’t write a book without making some, but. . . there seemed to be a lot here). And, I didn’t find the author particularly unbiased. It seemed fairly clear to me that she was more a fan of “real” careers than choosing to stay-at-home, whether that was to raise your children or to grow kale in your backyard to sell at the farmer’s market. If I still lived in Texas and was part of my beloved bookclub, this would very likely be my choice for 2014, mainly because I would LOVE to hear what those 11 other women who are smart, well-educated, and have a variety of different family and professional situations thought about the whole thing. I can only imagine it would have been a very interesting discussion. Instead, I’ll have to just ponder it on my own while my children eat some locally-sourced Lucky Charms for breakfast (vacation food, I’ll have you know. I don’t usually feed them marshmallow cereal for breakfast). I read about this book and found the concept intriguing, and I think your takeaway about the difference choosing to do things by hand or from scratch versus doing that by necessity is huge. I wish my library had this in audio; it sounds like a great candidate for shouting rebuttals to nobody during my commute. Interesting. As a single 30-something who doesn't currently have plans for marriage or kids, but will not judge you in the least for what you choose to do, I find the premise of homemaking and domesticity fascinating. There are so many different forms of those things. It's not just women who are staying home, but now dads are getting into the stay at home thing (or working from home). Families come in dozens of different forms, blood relatives or not. My family is my family and my friends are my family. I'm looking forward to reading this one. Oh man. I read this book and has the same reaction. I wanted everyone to read it so someone would talk about it with me. Like you, I found the ideas fascinating even if I didn't agree with all of them. And the author did not have enough material to make a full-length book. (It was, after all, based on her infamous "I'm obsessed with Mormon Mommy bloggers article from Salon a few years ago.) I wish she had done more research on some of her ideas to beef up the text. But overall, such fascinating material. Please ignore the typos. Please. I bought this one for my kindle when I first heard about it- and sadly, it is still waiting to be read on my kindle. Maybe someday…. I didn't realize that this was the same woman who wrote that Salon article – now I have to read, if for no other reason than to get in a debate with a book. "There is a huge difference between growing a huge garden, sewing all your own clothing, and making soap when you GET to choose that and doing it because you have no other options." YES! This! This book certainly sounds like it would make for a great discussion. I read Ashley's blog post too. I have to thank you for linking that up. I really relate to her whole "bored out my brains" homemaker discussion, and I feel like I'm surrounded by a whole bunch of happy homemakers. I think it's, in part, this whole New Domesticity movement, and all these women I know who are sewing and cooking and crafting, and I just don't enjoy that stuff. I mean, I don't hate cooking, but it doesn't fulfill me. Thankfully, I am able to teach a couple college classes every semester and perhaps someday that will translate into a bigger thing. I read this after I saw it on your "what I'm reading now" list (thanks again!). I enjoyed reading it and recognized myself in a lot of the anecdotes; not so much in the author's viewpoints. I found myself defensive for a large part of the book, because her tone comes through pretty clearly that she is firmly in the NOT domestic camp. My lifestyle is pretty far to the extreme side of what she (and I suspect you) thinks is too labor-intensive and unnecessary. I won't go into my own reasons for why I do all these things, but the point is that there are SO MANY reasons and SO MANY varieties of domesticity that that kind of generalizing drives me crazy. I still enjoyed reading it, but mostly because I enjoy arguing in my head as I read. oh, I'll be reading that in 2014. I sometimes struggle with this movement because I find it frustrating that people are claiming "living a creative life and doing what they love from home" when in fact their husband is the one carrying their health insurance, making sure the savings account is still growing, and being there if the Etsy sales fall through. I also agree that it takes a level of start up wealth to really be able to do that, and there's a huge difference between making soap because it's fun and making soap because you need to. I'm suggested my book club reads this next- thanks for the recommendation! As soon as I started reading this review, I thought, 'Wow, this would make a great pick for our book group',and sure enough you thought so too! Maybe I'll pick it in your honor! I love discussing things like this, but I find myself going back and forth on which side I most relate to, so it can be tortuous. Looking forward to reading it! Great thoughts. I'm definitely intrigued – it seems like the kind of book that would inspire A LOT of discussion in my book club, and among my more feminist friends. Thanks for sharing!